Travel management companies are the operational backbone of most managed travel programs. As close allies to travel managers, TMCs can take on many roles for the organizations they serve. They often act as transaction enablers, assisting with planning and booking travel, processing reservations, fulfilling transactions and supporting travelers en route. But that is not all: They also report, analyze and consolidate data that illuminates the management of travel. They help implement core travel technology or provide clients their own proprietary mobile, booking or reporting solutions. 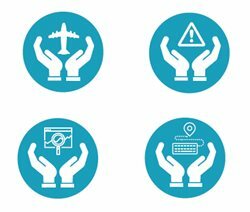 They can assist in the formulation, implementation and enforcement of travel policy, and are key players in risk management and security programs owing to their capability to track travelers and pinpoint them in crises. They also can lend support in supplier negotiations and relationships—or share the savings of their own negotiated discounts. Given the range of solutions TMCs provide and the diversity of managed travel clients, the structures these relationships take are varied. Three years is the most common TMC contract length, with more than a third of respondents indicating their current TMC deal extends for that period. 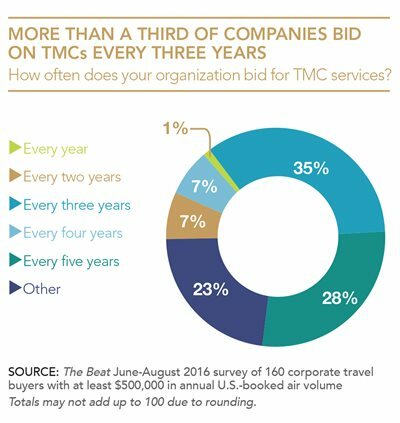 Not surprisingly, three years also happens to be the most common interval at which corporate travel buyers go out to rebid. After threeyear deals, five-year contracts were the second-most common response, representing nearly 28 percent. 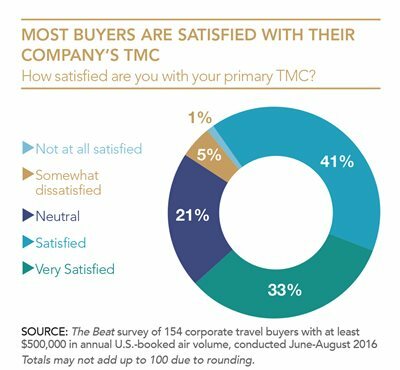 By and large, travel buyers are satisfied with their primary TMCs. Asked to rate satisfaction levels on an ascending scale of one to five, 33 percent ticked a five—or “very satisfied”—and another 41 percent selected just one notch down at four. Only one respondent was “not at all satisfied.” In more cases than not, these relationships are improving—or at least not deteriorating: Only 9 percent indicated the relationship between their TMC and their companies in the past 12 months had gotten worse, while 44 percent reported overall improvements in the past 12 months. A 47 percent majority saw their relationship as unchanging. The Beat, a publication of The BTN Group, fielded an online survey from mid-June to mid-August 2016. In total, 211 qualified corporate travel managers and procurement professionals responded. 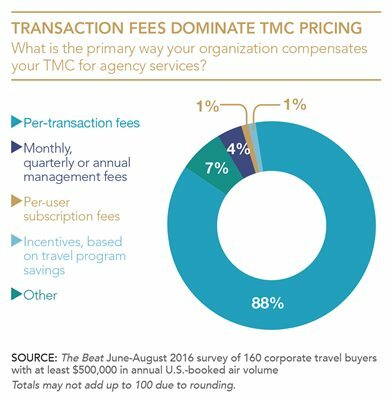 To better represent managed travel programs, our findings exclude quantitative results from companies spending less than $500,000 annually on airfares from the U.S. point of sale. Respondents identifying themselves as consultants, travel agency representatives or other suppliers also were excluded from the results. Of the corporate travel buyers whose quantitative responses were included, 13 percent spent between $500,000 and $2 million on airfares from the U.S. point of sale in calendar year 2015; 43 percent had U.S.-booked air volume greater than $2 million and up to $12 million; 15 percent had volume greater than $12 million and up to $20 million; and 29 percent had U.S.-booked air volume of more than $20 million. Not all respondents answered all questions, and each chart in this study indicates the total number of qualified travel buyer respondents for that question. The Beat supplemented these statistical findings by interviewing travel management company executives, corporate travel managers, procurement professionals and consultants. The Beat is the must-read digital publication for senior-level corporate travel professionals, providing breaking news, insightful views and compelling interviews on corporate travel distribution, travel management and technology. The Beat serves an audience of more 10,000 through its paid-subscription newsletter and website. The Beat Live is an annual conference bringing together over 125 senior travel executives. Copyright © 2016 Northstar Travel Media, LLC.